I personally like the "No longer needed" flag that was introduced. For me, it really simplifies the general reason for removing the comments and makes things easier when making that decision. On the flip side, how has the introduction of this affected the moderators who have to review the non-auto-removed comments? I remember having a conversation with a mod a while back on the same topic, but was curious about how it affect the mods generally when it came to their regular duties. That's a chart of comment flags by week for the past two years (excluding the current week) by who handled them. Comment flags are handled by "community" when a sufficient number of flags are raised on the same comment, or the post is deleted, or the author deletes the comment, or the comment matches a pattern). there are more comment flags being raised than ever before. 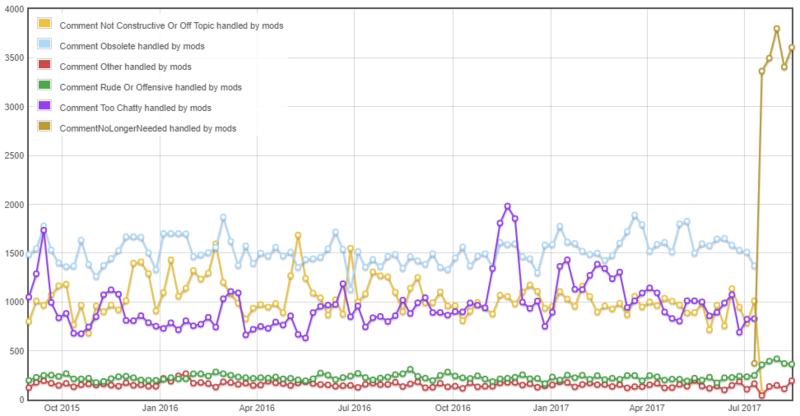 the bulk of the increase is being handled without moderator intervention. this is without Andy's script running. moderators are still handling something like 4 thousand comment flags a week. So... That's kinda nice. Folks are using the new flags and the volume isn't putting extra strain on the mod team. What about the strain of handling a different set of flag types? Well, what about another line graph? The volume of "other" flags (now "in need of moderator intervention") is about the same. Rudeness flags have increased pretty significantly, as I expected they would after the removal of "not constructive". But the vast, vast bulk of NC comment flags went straight into the "no longer needed" bucket, along with chatty and obsolete flags. Now... I'll defer to the moderators actually handling the bulk of these flags to share their experience with sorting out any ambiguities. For the time being at least, it appears that NLN flags are taking more time to handle than the flags they replaced. Now that we've spent some time handling the new style of flags (and that we have had two new mods who have no idea about how easy it was before), as a mod team we have improved. Most of us are now used to the new system and the earlier issues which I had mentioned in my previous answer are no longer there. At the moment, we are quite happy with the new system. Stuff which I think that are taking more time is mostly related to the previous obsolete comments. Earlier users used to flag comments as obselete when their post was edited, and hence we used to just check if the revisions has a change mentioned in the comment and delete the flag (which used to take 10 secs, mod dash > click the triangle to expand > middle click on revisions > delete comment). Now these are flagged as No longer Needed. Doesn't sound like it causes a problem, right? Wrong. People also flag irrelevant comments as No Longer Needed which used to be flagged as Non Constructive before. (An example would be, "your answer doesn't work for X" is actually an irrelevant comment when the post asks only about Y). This would need us to just check at the answer and the question to determine if it is right or a wrong flag. (A wrong flag here would be on a comment which brings out a fault with the answer). Now we are not sure what the flagger thought while flagging, (We aren't shown the flagger's name, so we don't know who's flagging to assume anything), hence we need to check if it's either obsolete or non constructive. This implies we have to do both the checks. 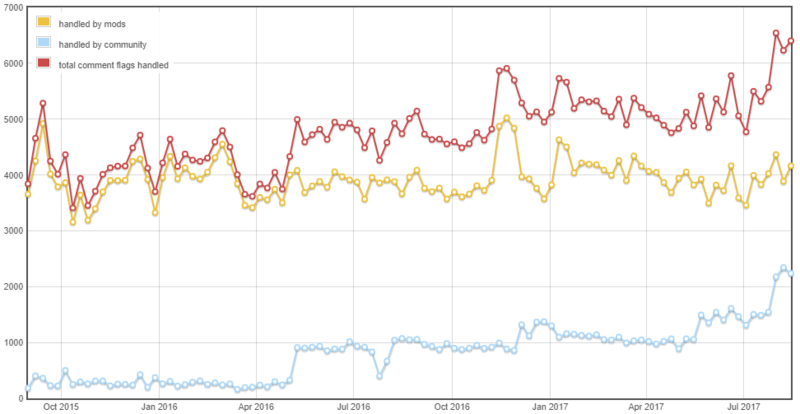 One another possible factor why we're taking more time to handle NLN than the earlier ones is that we're having very few comment flags in the queue at a given point of time (again thanks to the election). So we're spending a bit more time in not only cleaning the particular comment but also all the other comments on that post (Undo has written a very useful userscript to do this). This certainly would take more time than just deleting the comments on the mod dash. For the first issue, I think once we get used to the flow which we are doing now, we'd be able to get back on track. For the second, I don't think spending a couple of seconds more to cleanup more would be an issue.